“On Songwriting” was created in 2008 by Rick Jamison to help unravel the mysteries of how to write a song. The site features his personal musings on the art of writing a song, “Songwriters on Songwriting” interviews and other songwriting resources. 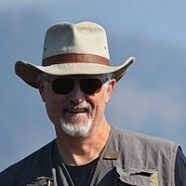 Rick is songwriter, flatpicker, author, and oil painter who has produced three CDs featuring his original music and is perpetually working on new songs and projects. His songs have been performed and recorded by various bands and his music is prominently featured in the documentary film [easyazon-link asin=”B0030ATMY2″ locale=”us”]Jump[/easyazon-link] about the annual frog jumping competition in Calaveras County made famous by Mark Twain. Rick has been a featured guest on numerous radio shows, and his original music can be heard from time to time on local public radio stations and podcasts. Rick lives on Vancouver Island, BC where he is adored by his wife, Kathy, and occasionally acknowledged by their standard poodle, Winston. “The Magic Hour is a very impressive collection of original music from an equally exciting talent. 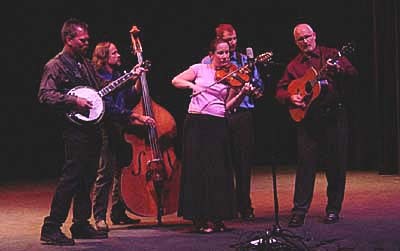 Rick Jamison (right) performs with his band, Rick Jamison & Copper Canyon, in Yreka, California in June 2004. I wanted to let you know about a great event for songwriters, singers and musicians – The Songwriters Telesummit. Coming August 22 and 23, 2009. A teleconference for songwriters, singers, and musicians that explains how to get music into television and film, create inexpensive tours, find alternatives to touring, interpret and personalize songs in performance, manage performance anxiety, and much more. With Gretchen Peters, Mary Gauthier, Eric Maisel, Susan Raeburn, Andrew McKnight, Michael Shorr, Rebecca Folsom, Celeste Krenz, Michael Bowers, Siobhan Quinn, Tom Prasada-Rao and other experts. An essential conference for every musician—folk, jazz, pop, country, rock, hip-hop, R&B, whatever your musical style.